A smart couple is one who has done their homework well. They have crunched the numbers well enough to have a clear idea about exactly what they are going to spend on wedding invitation cards. On the big day, every one wishes to make out a difference with some unique ideas. These days’ people know how to get a good bargain and yet have an extraordinary personalized wedding card designed. The internet provides us valuable sources of inspiration to develop beautiful designs. And guess what one can clearly get their estimations calculated with just few button clicks. Reasonable but unique card designs with a personal flair added can definitely be the showstopper for the evening. Thermo Graphed Invitations for Wedding – Thermography is widely used nowadays by couples for designing their wedding invitations. It is a style of printing much like engravings made on cards. It is cost effective and fast to be processed. Ink is combined with dry particles and letters are engraved on paper with it. Engraved Cards for Wedding Invites– Engraving is a certain style of printing which is mostly used for creating traditional wedding invitation cards. In this process, the copper plate is used by experts to engrave the words of the wedding invite on the copper plate. This plate is then used as a mould and put inside the press. Ink is used and a press is created over the paper. The raised letters are left out as a print on the paper and hence it derives the term “engraved”. Handwritten Cards– Nothing can be as personal as a handwritten invitation card on a wedding. 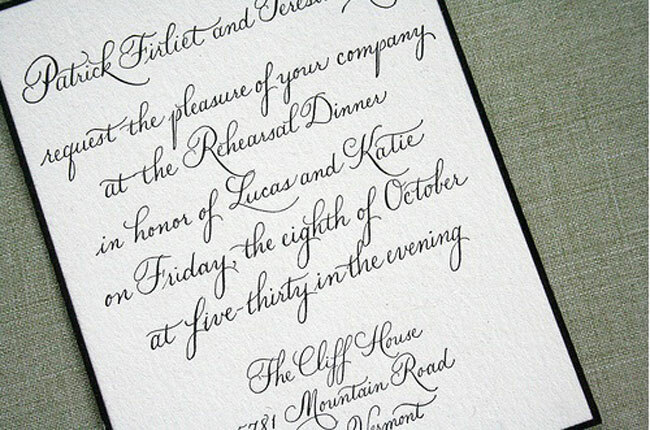 Usually, people use a white based card or a one colour card and write a proper formal invitation wording over it. Such cards are really affordable and the best part is that one can add a great deal of customized touch on it. Off-set Printed Cards– The off-set printing wedding cards are the generally printed cards used and can be used for multiple purposes. They are ideal for any wedding. Not only are they cost effective but also offers a highly graceful look. Contemporary Cards for Invitees– Traditional wedding events will always be on the favourite list of people. Such conventional and contemporary wedding event requires a card aligned with its look and feel. Contemporary wedding cards for the invites can be an excellent choice. Mostly for formal as well as ultra-formal wedding events, these are chosen. There exists a huge plethora of wedding invitation styles in addition to the above in the market. One can even research over the web about varied themes and ideas. Based on the budget and preference one is recommended to choose the style of the invitation card. After all, a unique affair like the wedding does need something extra unique.